Sometimes, being someone who rides in bike in Croydon can be a rather depressing business. Especially when I look to other boroughs (yes, I mean you Waltham Forest) where enormous and exciting changes are taking place, making community streets safer and more pleasant to walk and cycle along. However, I do try not to be a pessimist about everything all the time, so would like to take a moment to highlight some of the lovely things that are happening in Croydon. Firstly, play streets. London Play is a charity supporting local residents who wish to set up temporary road closures so that safe, traffic-free spaces can be created, so our kids can get out and play outside on the street. It might seem a simple thing, but data shows our children just aren’t getting out and playing outside as much as we did when we were kids. With motor traffic dangers being one of the key reasons parents are worried about letting their children play out in the road. One of my neighbours, Emma Hope-Fitch, is already a local legend for all the hard work she has put in to making our community a safer, happier place. Thanks to her, galvanising the rest of us into action, we’ve enjoyed fantastic big lunches, monthly play streets, the emergence of a delightful guerilla garden-come-playground and now weekly sit-outs, all of which are about reclaiming our streets as spaces for living, playing and making new friends. She’s now setting here sights on bigger things, with Central Croydon’s first play street happening this Saturday on College Road (details can be found here). Secondly, another Norwood local, Angus Hewlett, is also doing all he can to get Croydon’s next generation out on their bikes. I spotted that he recently donated one of the Crystal Palace Transition Town cargo bikes to the Crystal Palace Library of Things, a brilliant way of testing out if one would work as a family ride before investing. 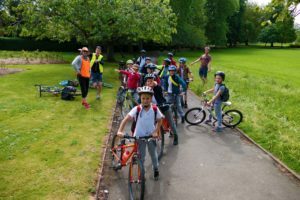 Equally, as a co-founder or the Cypress Cycling Club, he can be seen most weekends at South Norwood Lakes running skills training sessions and leading family friendly rides, with a Crystal Palace FreeCycle feeder ride on the cards. The Cypress Cycling Club is open to all local families and details can be found here. Cypress Cycling Club heading to the Croydon Cycle Fest in May. Wonderful – well done Emma. Page admin – Make the Cypress Cycling Club larger!